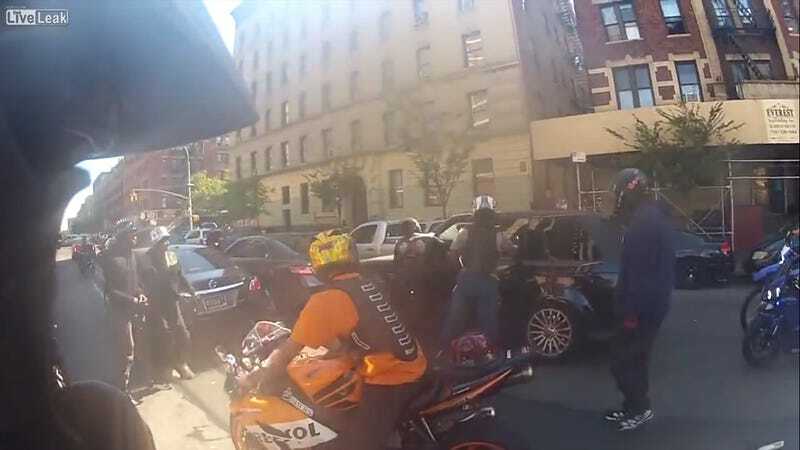 Not only was an undercover cop present at the beating of Alexian Lien at the hands (and helmets) of a number of NYC bikers, the unidentified officer apparently struck the vehicle as well. Now, he has been arrested. The unnamed officer was caught on video beating on Lien's Range Rover, breaking the rear window. This goes against earlier claims by the undercover officer's lawyer that he only was a witness. The undercover officer also reportedly waited three days to report that he had been in the mass biker ride. CBS News reports that the officer is expected to be charged with with criminal mischief. UPDATE: The officer in question has been named by a police spokesperson. The officer's name is Wojciech Braszczok. He is a detective and he was off duty at the time. He has been charged with riot and criminal mischief, ABC News reports.